Raul Anguiano was born in Guadalajara, Jalisco, Mexico on February 26, 1915. He is considered one of the best artists of the Mexican modernist school of painting. 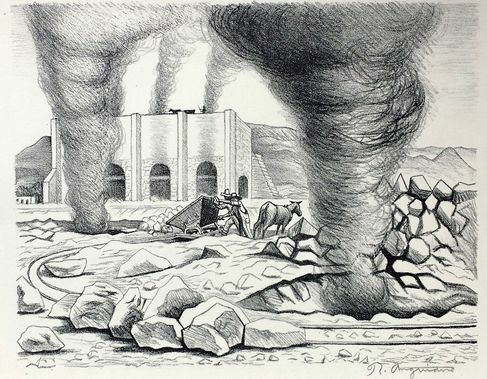 At a young age he started at the Escuela Libre de Pintura de Guadalajara where he organized, along with several other artists, the group of Pintores Jovenes de Jalisco. In 1934 he moved to Mexico City where he joined the Liga de Escritores y Artistas Revolucionarios (LEAR) and was founding member of the Taller de Grafica Popular (TGP). Because of his great talent, he had the honor of holding his first solo-exhibition in the Palacio de Bellas Artes, a venue usually reserved for highly recognized artists. In 1941 he traveled to New York and joined the Art Students League. Later he would also travel to Cuba, Egypt, Syria, Turkey, Japan and most of Europe. Back in Mexico City in 1952 he founded the Salon de la Plastica Mexicana and became professor at the UNAM in 1959. 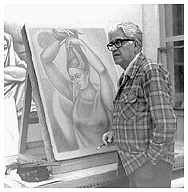 His work as a muralist began in 1934 where he painted a fresco for the Escuela Carlos A. Carrillo in Mexico City titled "La Educacion Socialista". Sadly his first mural has since been lost, but many other of his murals remain such as "La Creacion del Hombre Maya" and "Deidades de Mesoamerica" at the Museo Nacional de Antropologia. Anguiano also played with the surrealist movement with works such as "La llamada del instinto" and "Nacimiento y Muerte" in his mural work and many of his easel paintings. One of his most famous works is "La Espina" (Museo de Arte Moderno) from 1951 where a young indigenous woman scrapes her foot with a knife trying to get a thorn out. It is his sense of nationalism and the mastery of his brushwork that gave him a strong notoriety in the Mexican art world. As a print maker, he made sublime compositions that were published by the TGP, Atelier Decima in Paris, Taller Libre de Grabado de Mario Reyes and Bill Anderson Print Atelier in California. He also illustrated books for Wilberto Canton and Carlos Margain among others. Raul Anguiano, a true master artist and muralist from the Mexican School of painting lived the last years of his life in Los Angeles, California until he fell ill and was flown back to Mexico City in a presidential jet. He was treated for heart problems at the Hospital Militar where he died on January 13, 2006.